Architecture isn’t always everyone’s cup of tea, and neither is installation art. Personally, reading about architecture bores me – there’s just something about not being in the architecture itself that irritates me. The inability to feel the space described. And this is exactly what Sensing Spaces is about: feeling. Li Xiaodong’s timber forest. Own photograph. The Royal Academy of Arts has done a wonderful job of gathering together seven international architects to create architectural installations within the Main Galleries that challenge our senses, whether it be our perception of space, light and shade, familiar and unfamiliar smells, or even touch. Diébédo Francis Kéré’s honeycomb of straws. Own photograph. In a few of the installations we are encouraged to interact with the space around us. Perhaps the most interactive – and most fun – was Diébédo Francis Kéré’s honeycomb structure which begins in one room and ends in the next. 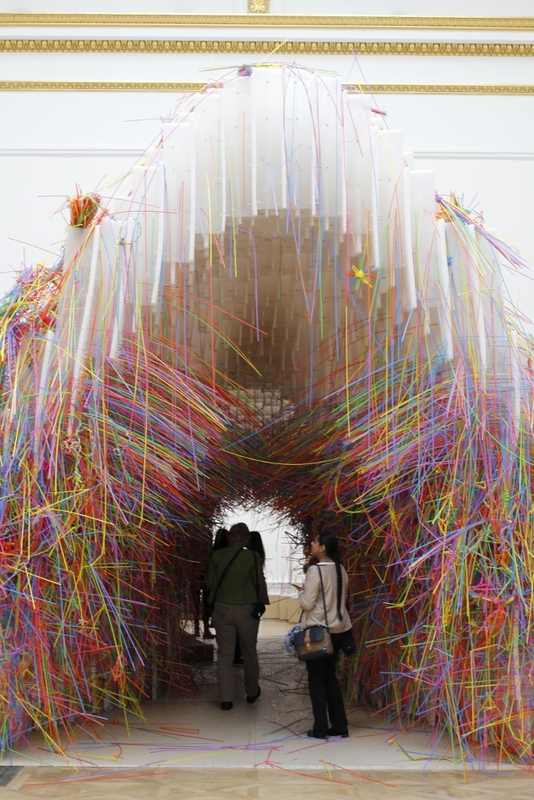 Brightly coloured straws are available for visitors to take and one is encouraged to place them into the holes within the structure. As a result, we become part of the structure’s creative process. There were unaltered straws, various intertwined constructions, and creations that probably didn’t turn out as one had visualised – the latter certainly applies to my own creation which resembled a lollipop. Nevertheless, the idea is to evoke one’s creativity, and a lot of the younger members of the public appeared to enjoy it more than the parents could tolerate. The other concept was that of unfamiliarity. As one enters the honeycomb structure, surrounded by these wonderful displays of colour, one begins to lose their sense of place, and it is still difficult to take in the fact that we are in a different room after we’ve emerged from the other side. 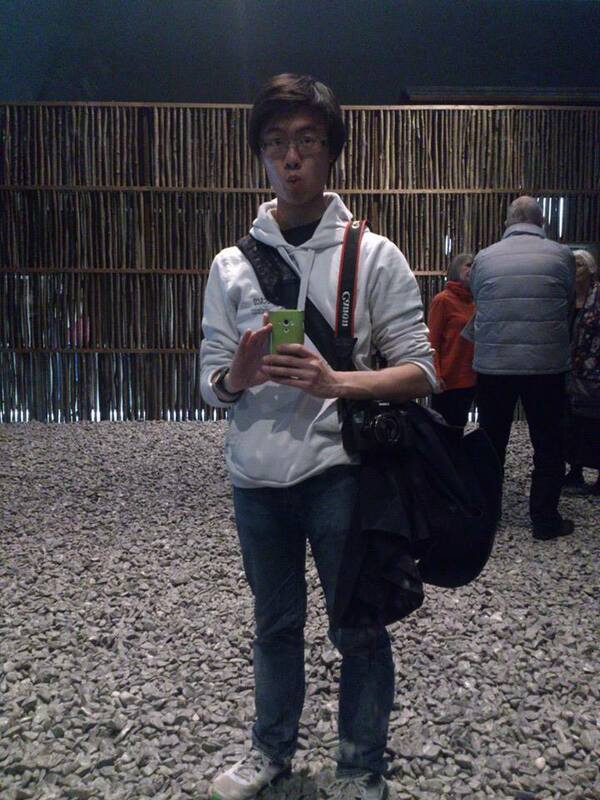 Zen garden ‘selfie’ (excuse the pout). Own photograph. Unfamiliarity also has a place in Li Xiaodong’s timber forest. 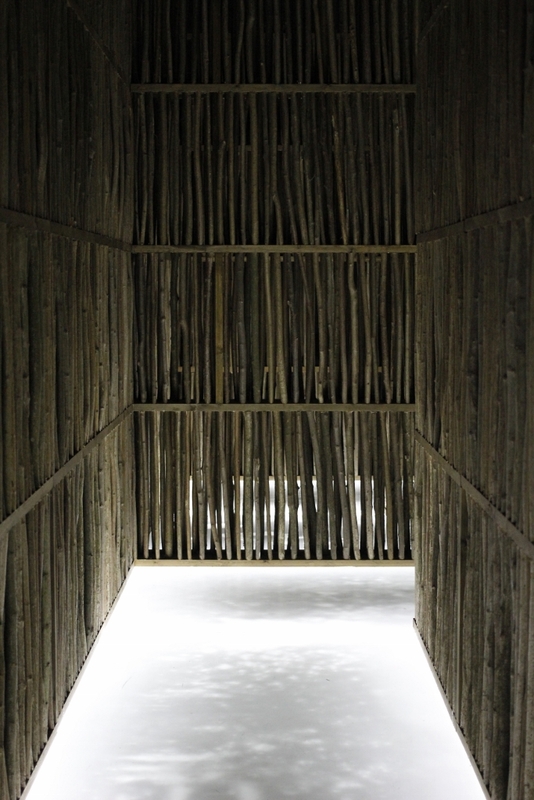 With a floor illuminated by LEDs, the narrow timber walls recreate the sense of being lost in a forest – literally – and we embark on a journey of discovery as we make our way through the maze-like construction. The lighting from the floor created a rather peaceful setting, and peace is certainly what we find at the end, embodied by the presence of a Zen garden, deceptively enlarged spatially by the lining of mirrors upon an entire wall. Needless to say, the garden became a room for ‘selfies’ to manifest, myself included. 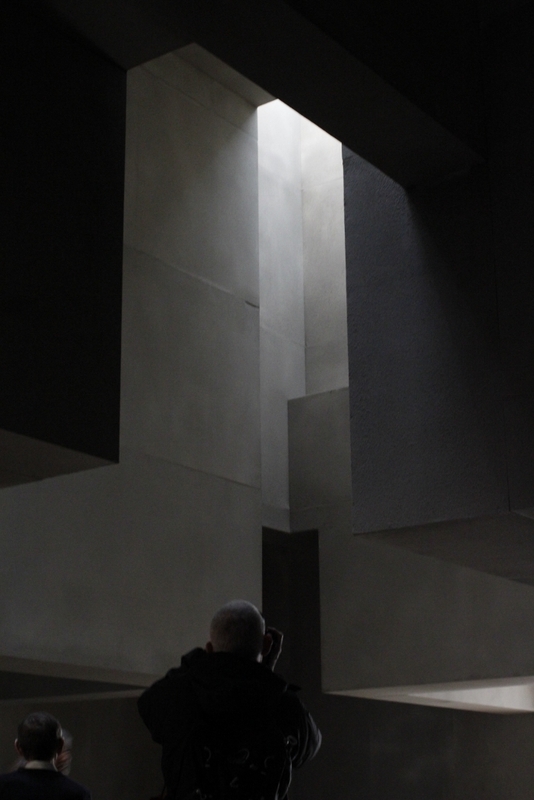 Grafton Architects’ weighty, isolated room of gradually changing light. Own photograph. It is amazing what changes in lighting can do to one’s perception of space or to our state of mind – dim lights and candles, ladies? Grafton Architects have cleverly used this to their advantage in one of their installations in the Lecture Room. This particular one features a set of suspended structures – think three interlocking rectangles hanging from a ceiling – which manipulates the room and our sense of freedom. As visitors, there is a sense of confinement and containment, a certain claustrophobia – I felt as if I were inside a dark abandoned warehouse. Peaking in from two opposing cornered openings were roof lights that gradually dimmed and brightened, shifting between warm and colder lights, evoking the changing times of the day and night, the visual perception of a warm sunny day or the cold, tranquil moonlight. It was this combination of physical solidarity in the structure and the subtle interplay of light and shade that made this installation one of my favourites in the exhibition. 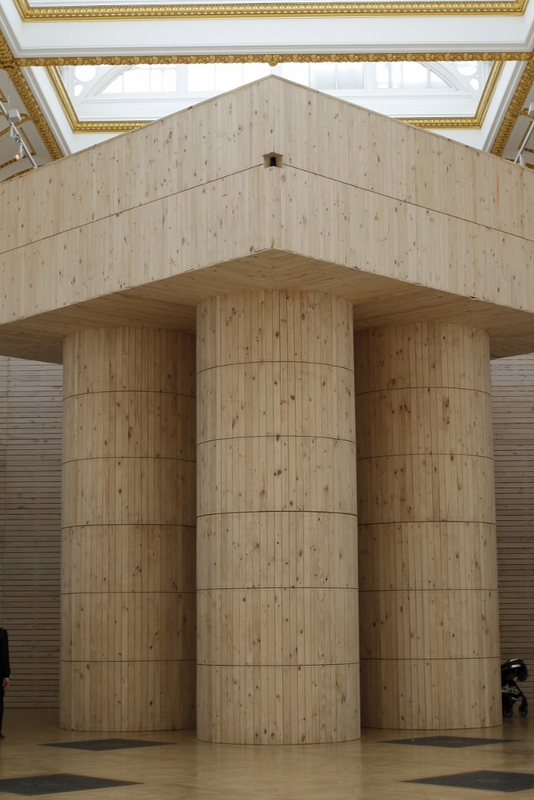 Pezo von Ellrichshausen’s monumental timber structure. Own photograph. The remaining installations were all very amusing. Pezo von Ellrichshausen gave us a kind of treehouse in which we could climb up to using the four spiral staircases beneath the wooden platform, essentially containing us, save for a few small holes to peek out at the people below, or to the decorative structures of the room. Its emphasis was certainly for one to contrast the geometric wooden structure to the elaborate vaulted ceiling that was now so close to us – you don’t realise just how high up you are until you walk the almost endless trail up or down via the disability ramp. Kengo Kuma’s bamboo intricacies. Own photograph. 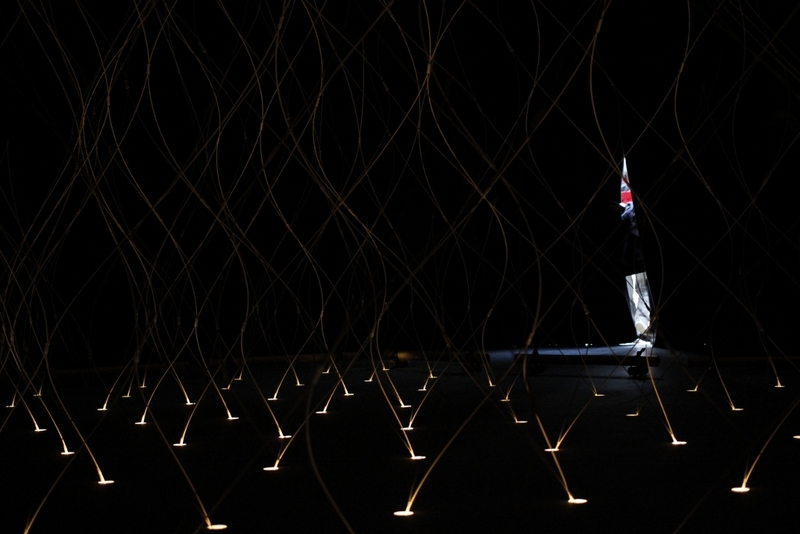 A sense of awe and lightness exuberates from Kengo Kuma’s delicate bamboo structures that are lit by LEDs where they touch the floor. It’s almost like Christmas has come early. Eduardo Souto de Moura, on the other hand, has chosen to imitate the interiors of two door frames in the gallery, casting them in concrete and allowing them to stand at a 45-degree angle to the originals. This tension between the replica and the original is a literal reflection of the building’s architectural elements, forcing the viewer to notice these often banal decorations. I definitely enjoyed it! Own photograph. 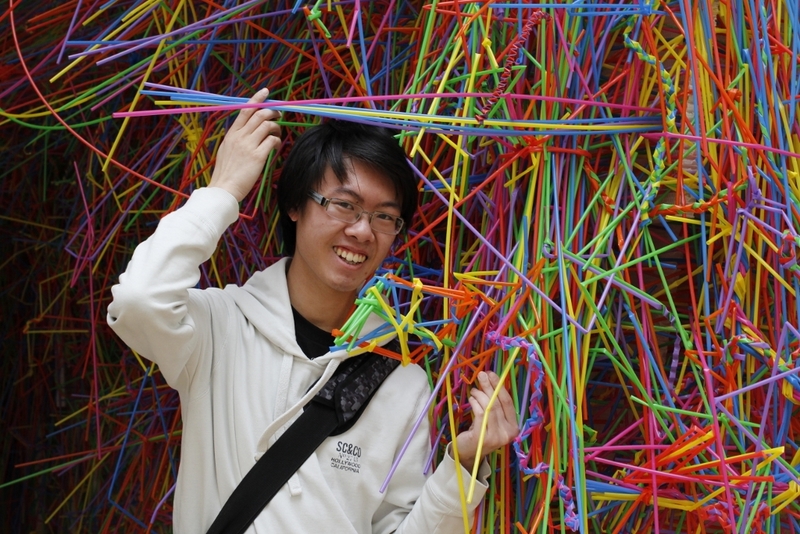 This is a highly enjoyable exhibition and I encourage anyone to take the opportunity to feel their way through these perceptually stimulating environments, whether as an excuse to take ‘selfies’ in front of the mirror, to make random straw creations, or to get away from the city scene to smell the force of nature. This is a must-see show suitable and fun for everyone who loves something different. Sensing Spaces: Architecture Reimagined runs until 6th April 2014 at the Royal Academy of Arts, London, http://www.royalacademy.org.uk.